How do you like traveling with toddlers in airports? 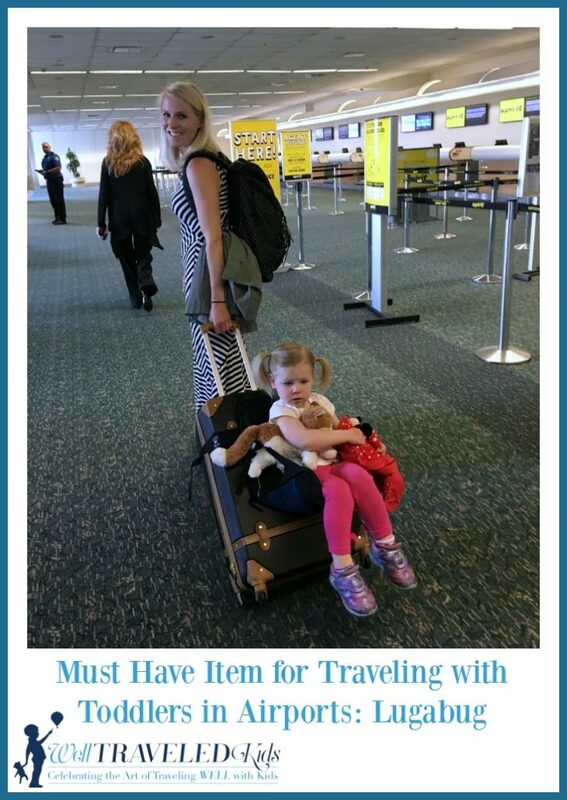 Have you ever had to hustle through the airport with your kids? I don’t mean just pick up the pace. I’m talking full out sprint with toddlers in tow to make your flight? In this situation, I guarantee your kids will find something intriguing to look at. Maybe they need their shoes tied or flat out refuse to walk anymore when the situation is mission critical. That’s why I used to dread traveling with toddlers in airpots by myself. I recently traveled with my 2 and 4 year old from Chicago to Orlando by myself. I was thrilled to test out a new product that basically carries your kids for you. Lugabug is a portable seat that attaches to your rolling luggage. It clips on in seconds. It transforms into a seat for kids ages 2 and up to perch on while you roll them through the airport. The max capacity is 60 lbs, so both of my kids qualify for rides. Since both of my children thought it was a “neat new ride,” I had both of them test it out. I decided to forego a stroller on this trip because my kids are pretty much over them. But, they still get tired on long walks to the gate. I have been that mom carrying one kid on my back, one kid on my front and painfully dragging suitcases behind me as I limp along. The Lugabug was the perfect solution. It also gave me a free hand that I wouldn’t have had if I brought a stroller. When finished, the seat could easily be placed inside my suitcase. Or, even used as an extra pocket to stash those trashy magazines I so love to purchase at the lounge stores. Bonus- none of my carry on suitcases have an exterior pocket, so this is a welcome addition. This is absolutely one of those “Why didn’t I think of that?” products! I had a dozen strangers ask where I purchased it. 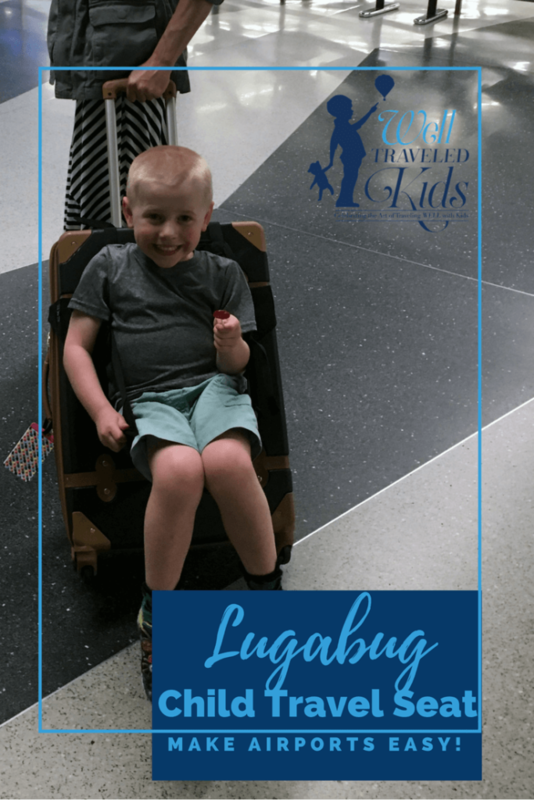 One of the best features is that the Lugabug is EASY to use when traveling with toddlers in airports. Previously I purchased a contraption that hooked up to your child’s car seat so you could roll it through the airport. We ended up throwing it away because I honestly couldn’t figure out how to attach it securely. And no, I wasn’t just sleep-deprived; my husband was similarly baffled. Also, the Lugabug is small enough to keep out of the way when you arrive to your destination. You can slip it inside the pocket of your suitcase and it won’t take up any precious hotel room square footage. It is lightweight (approx. 18 oz) so won’t tip you over the scale when checking luggage. In my opinion, this product will stand the test of time- high quality construction and materials that make for a product that can be handed down from one child to the next. It is available in two colors- blue with black reflective accents and grey with pink accents. Here’s our video to show how simple Lugabug is to use! Have a family vacation with the kids coming up? Pin this so you can save it for later! Disclosure: I was provided with a Lugabug for review purposes. All opinions are honest and my own.